I’m so excited for this challenge, as I get to share with you all—and of course with the ladies—some of my favorite Meat On The Side recipes! One of my main goals when writing Meat on the Side was to show everyone new ways to do veggies, and to prove that veggies can be the star of every meal. But you can’t have the vegetable as the entrée portion of your plate if it’s not special, so I’m constantly rethinking some of my favorite veggies and challenging myself to do fun and interesting things with them. 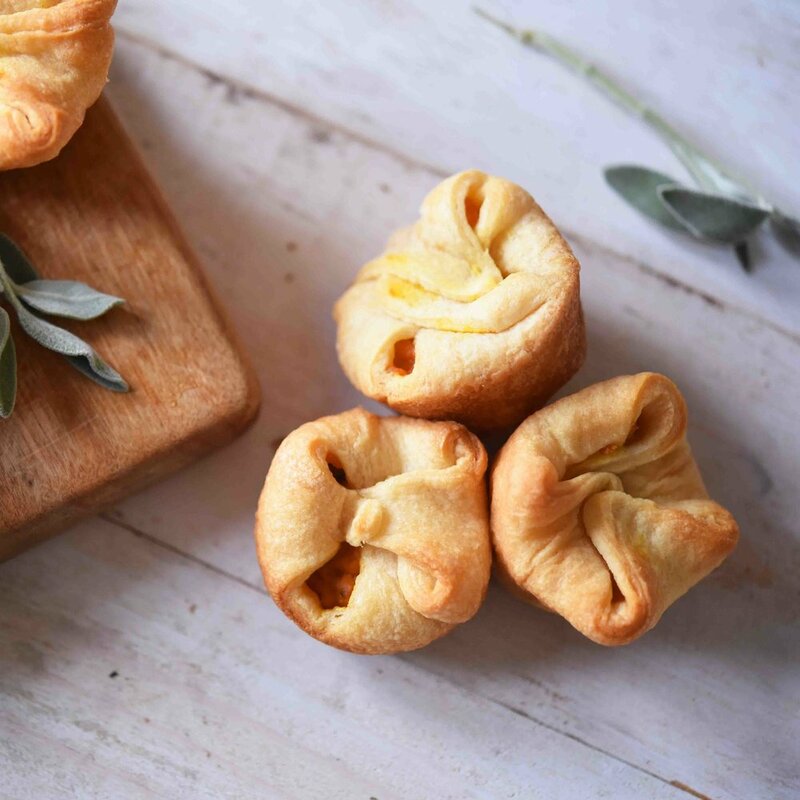 For our challenge, I chose to whip up these Pumpkin Poppers because I love making and freezing a big batch of them to reheat for company all winter long. I'm adding "fun" and "interesting" to pumpkin by pairing it with spicy chorizo, then folding in luscious, creamy goat cheese and vibrant chives. This will give you a mixture you could easily and happily just eat right out of the spoon. But once you're able to put the spoon down, I encourage you to continue to restrain. 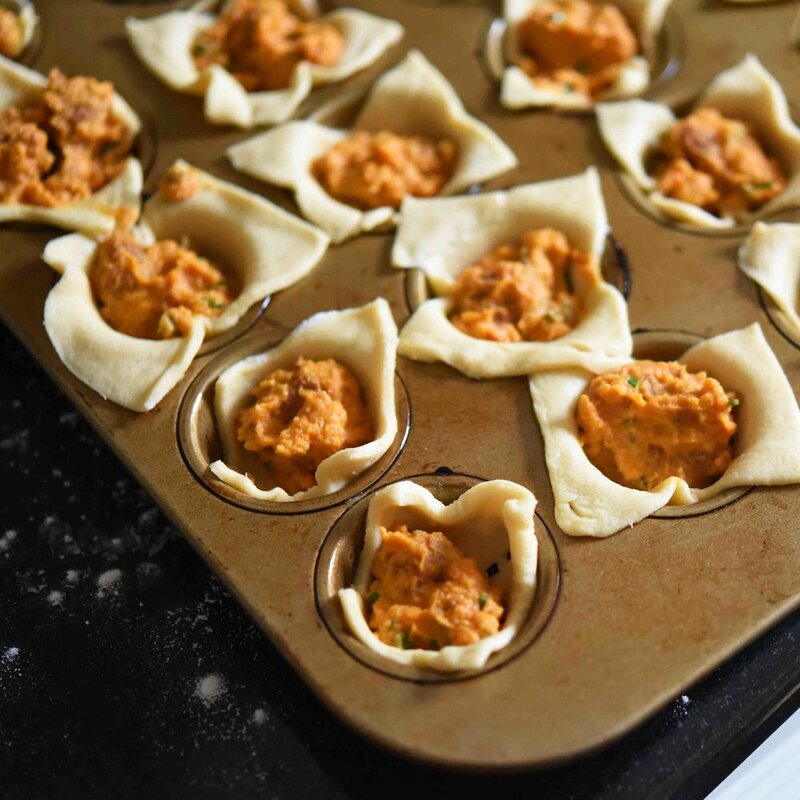 Because next I want you to fill up little cups of crescent roll dough with the mixture, creating a bite unlike any other. You could leave the dough in cup form, but when you fold the corners over the filling, you end up with a little pocket of goodness—one that’s mess free, portable, and just darn cute. So let’s think about veggies in a whole new way, starting with these Pumpkin Poppers! Preheat the oven to 350°F. Heat a large skillet over medium heat. Remove the casing from the sausage and add the meat to the pan. Cook for about 4 minutes; as it cooks break it apart with a spoon until you have ¼- to ½- inch pieces. Turn the heat down to low and add the pumpkin, cheese, and salt, and stir until the cheese has melted—about 2 minutes. Turn off the heat and stir in the sage, chives, and nutmeg. Transfer the filling mixture to a plate and place in the fridge to cool slightly while you prepare the dough. Grease two mini muffin tins. Unroll the dough from one can onto a lightly floured surface. With your fingers, pinch together the dough along the perforations dividing the rolls, so the sheet holds together. Then roll out the dough until it increases in size by about one-third, into a rectangle that is about 12 by 18-inches. Use a sharp knife to cut the rectangle into 24 squares, making 5 cuts crosswise and 3 cuts lengthwise. Separate the squares, placing each one into a muffin-tin cup. Repeat this process with the dough from the second can. Spoon 2 teaspoons of the filling into the center of each dough square. Then fold the dough corners over, enclosing the filling. Place the muffin tins in the oven and bake until the dough is golden brown—about 15 minutes. Serve hot! Keep It Simple—(1) Chorizo has big flavor and adds a lot to this dish, but feel free to use whatever your favorite sausage is. (2) Sometimes you will find crescent roll dough sold as one seamless sheet, purchasing it this way is a great timesaver for making this recipe. (3) Depending on how much filling you put into each popper you may end up with a couple empty squares of dough. Simply bake these with rest of the poppers and enjoy them with dinner or as a snack. (4) These go fast! So I like to make a lot, but you can easily halve this recipe for a small group, reserving the extra pumpkin for another use. Family Friendly—I have watched kids gobble these up without a second thought. The poppers don’t end up being very spicy but you may want to watch how spicy a sausage you use if your kids are not used to spicy foods at all.